Description A lighter plate may seem right for a change of season, or you might just want to stretch a meal, this main dish salad can do both. For the dressing, place garlic in a small bowl with 1/4 cup olive oil and cover. Microwave for 30 seconds. Remove garlic to another bowl and mash with fork. In a food processor chop basil into a paste. Add vinegar, mustard and honey. Blend in mashed garlic and garlic oil. Season chicken with salt and pepper and cook in oil over medium high heat until golden brown and cooked through, about 5 minutes per side. Remove from pan and shred or slice. 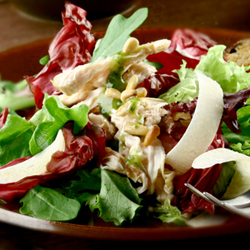 Arrange greens and radicchio on individual plates and top with chick. Reheat pan that chicken was cooked in and add dressing, heat through stirring in browned bits and drizzle over salad.